So, I dug into work by Enki Bilal and François Boucq; their tactile styles really show, for lack of a better description, the paper and ink as much as the lines they comprise. Their work feels like handmade art, and I loved it because, even if it was work from the 1970s and 1980s, it felt so new. 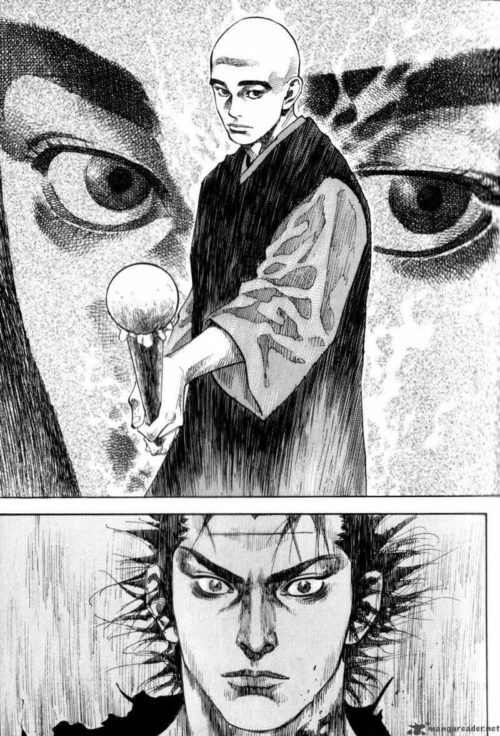 But, for style I found inspiration in Takehiko Inoue’s Vagabond, which I’ve briefly discussed before with regard to his willingness to shift inking styles and approach simply for the sake of the emotions of the scene. Though his comics can’t claim linear consistency, there is a consistent quality that underlines the entire work, from story to character design to how he uses this variety of styles. A major factor that I’m bringing into Long John starting with this page is inspired by Inoue’s gleeful shifting between realism and expressionism (to an extent). That is, how liberally he presents the comic, bouncing between highly realistic art (meant to accurately represent the real world) and incredibly figurative art (showing things that other characters likely don’t see but express something more than simply “reality”). One way he does the latter is to play with the line quality and medium; no doubt the characters don’t suddenly see a shift from a realistic character to one thickly outlined by visible dry brush strokes, for example. Representing fear as a demonic entity, bright eyes shrouded in hatched darkness. 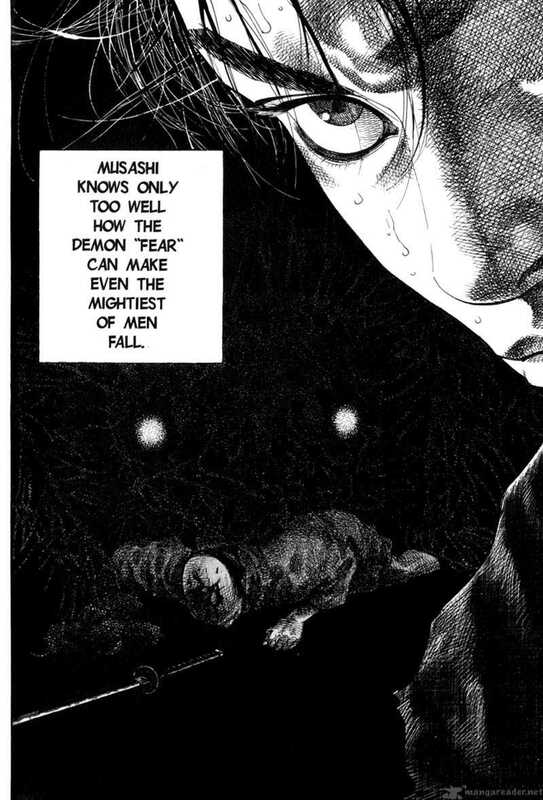 Takezo is, however, haunted by a lot of death in which he was either involved or directly caused, and this repressed darkness sometimes gets the better of him. When it does, Inoue represents it in the comic in very sketchy lines, incredibly exaggerated action, and grotesquely deformed proportions. 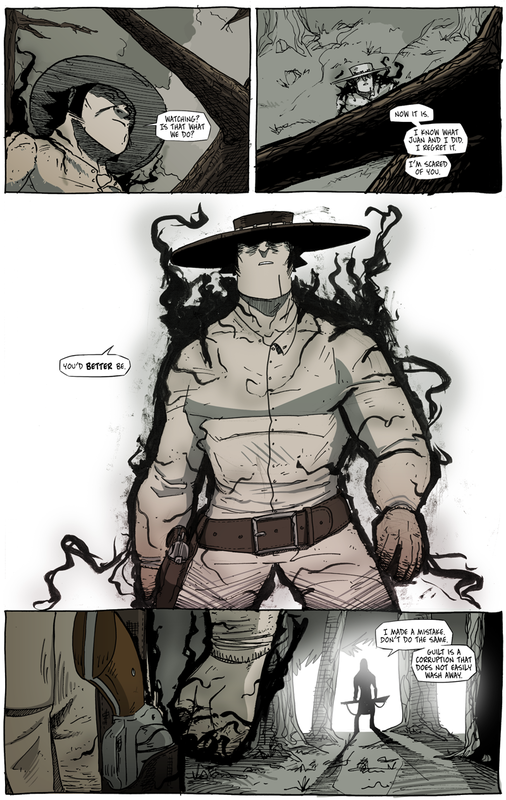 Things get weird (and violent) in this otherwise highly realistic comic. I wanted do incorporate something like this in Long John, especially regarding the internal conflict between his old way of thinking––his arrogance and entitlement––clawing to take his mind back over. Basically, it’s “the rot” that Hellrider Jackie warned about way back at the beginning of the comic. It’s strictly figurative and not something that exists in the world itself. Perhaps it’s a step too far, but it’s a step I’m willing to take.